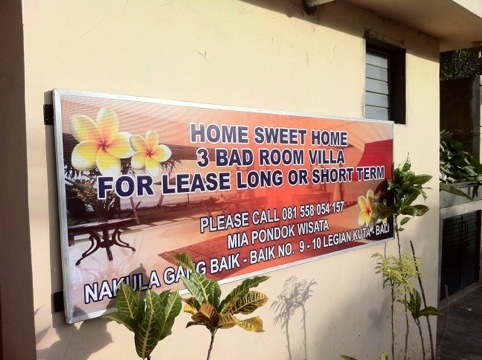 Makes you wonder what a “good” room villa is? I’ve been living alone in this huge two story villa for 4 weeks now and finally the love of my life has returned (with some family members in tow), to brighten my life and prevent me from going “Island Crazy” without them. A welcome invasion of this huge empty space, if ever there was. So, Fiona and “bubindabelly”, arrived about 2pm in the arvo and I picked them up “quick-az” on the scooter in an absolute flash. I was in and out the airport quicker than a teenage boy in a brothel. A 60 year old American man…in his underpants! My next door neighbour, John. He’s a nice guy with a big heart but, an even bigger pair of y-fronts. His heart is definitely in the right place, but his underpants are usually not (up around his neck). So we talked, swam…and looked away every time he climbed in and out the pool. About 11pm that evening, I picked up Fiona’s Entourage (mother Irene, sister Stephanie and niece, Candy). Only this time, I was in a cab with our Bali Taxi driver friend, Gede, so we were in and out the airport slower than a 40 yr old Bigfoot enthusiast losing his virginity. So, ’tis the night before Christmas and all through the house, not a creature is stirring except...the hacking cough and moonlight twinkling of a sixty-year old man bobbing for Xanax.